Many of you are naming our favorite tunes from different time periods to mark your A to Z challenge. I think that is a great theme to pursue. I thought I would list some of my favorite music. Since last night I was in a conversation with some young folks and I was learning some of the music they like. The mentioned Fleetwood Mac. I agreed, they mentioned the Beattles. Which I can give credit too, however, I am not a fan. Then they listed another group which has been inducted to the Hall of Fame, which I thought was horrible. These are all opinions. Which every knows is like arm pits. Everyone has a couple. Well my iPod/iPad/iPhone has music that ranges from "You gotta hear this" to "Don't Judge me". These are just a few off the top of my head. I also like a few of Sir Mix-a-Lot, Bullethead, Poison, and The Judds. Again, don't judge me. What is your favorite music? Now if its not on news radio or played in a movie, I don't hear it. Have a great day and enjoy the challenge. Now you're asking! Musical tastes always cause debate, or full-on arguments. Sometimes a really favourite piece of music isn't what you want to hear "now". 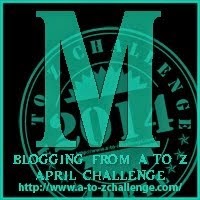 Good luck with the A to Z Challenge.